Merck & Co., Inc. (NYSE:MRK) is one of the stocks that has seen an increase in bullish sentiment among hedge funds, with Hal Mintz, Stan Druckenmiller and several other investors joining the list. Overall, as the hedge fund intelligence website Insider Monkey shows, MRK was in 77 hedge funds’ portfolio at the end of September, up from 75 hedge funds at the end of the second quarter. 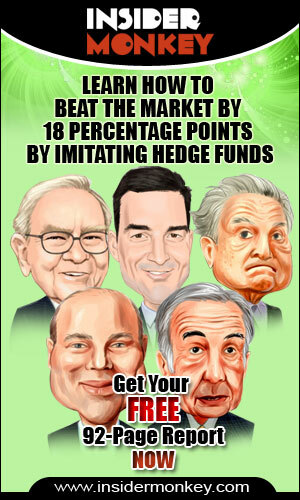 Insider Monkey is engaged in tracking the activity of some of the best-skilled hedge funds. Out of a total of 8,000 functional hedge funds in the world, Insider Monkey has picked the best 700 that manage the largest part of the total industry’s capital. While most investors don’t pay enough attention to hedge funds considering them slow, old financial instruments, experts at Insider Monkey have actually discovered several interesting stock-picking strategies. For example, their small-cap strategy managed to beat the S&P 500 by as much as 18 percentage points per year, over the long-term. With all of this in mind, we’re going to take a look at the recent action regarding Merck & Co., Inc. (NYSE:MRK). As we have mentioned earlier, at the end of September, a total of 77 of the hedge funds tracked by Insider Monkey held long positions in Merck, a change of 3% in comparison with the second quarter. In this way, with the smart money’s positions undergoing their hands-changing, there exists an “upper tier” of key hedge fund managers who were increasing their holdings substantially during the third quarter. One of these funds is Ken Fisher’s Fisher Asset Management, which had the biggest position in Merck & Co., Inc. (NYSE:MRK), worth close to $387.3 million, However, this stake accounts only for 0.8% of its total equity portfolio. The second largest stake is held by D E Shaw, managed by David E. Shaw, which held a $270.7 million position, equal to 0.4% of its total equity portfolio value. Also, other hedge funds that hold long positions comprise Peter Rathjens, Bruce Clarke and John Campbell’s Arrowstreet Capital, Phill Gross and Robert Atchinson’s Adage Capital Management and Cliff Asness’s AQR Capital Management. Consequently, several hedge funds have been driving this bullishness. Sabby Capital, managed by Hal Mintz, created the largest call position in Merck & Co., Inc. (NYSE:MRK). Sabby Capital had $37.5 million invested in the company at the end of the quarter, while John Overdeck and David Siegel’s Two Sigma Advisors made a $25.9 million investment in the stock during the quarter. Among other funds with new positions in the stock are Stanley Druckenmiller’s Duquesne Capital, Dmitry Balyasny’s Balyasny Asset Management, and Michael Hintze’s CQS Cayman LP.